04 Oct 2018 --- The Australian ice cream market is thriving, according to Pecan Deluxe Candy. Intense competition between the big players in the market is leading to R&D innovation in Australia, one of the largest markets for ice cream in the world, with one of the highest per capita consumption, according to the company. According to Innova Market Insights, ice cream subcategories are recovering growth in Australia; there has been a 14.6 percent growth in product launches for the time period covering 2013-2017 (CAGR). The market consists of artisanal ice cream – dairy and water-based; impulse ice cream – single-serve tubs, packaged cones, sandwiches, chocolate-coated ice creams and take-home ice cream – multiple-serving tubs and ice cream cakes. Unlike densely populated areas, the multiple-serving tub is the biggest seller, this is attributed to the size of the population (just 24 million) versus the sizeable geographical terrain. Recently, this has attracted many global ice cream players including Ben & Jerry’s and Baskin Robbins, which has resulted in increased competition in the market. To compete, local players rolled out items with innovative flavors and are also entering into joint ventures with foreign companies to offer new products. For instance, Bulla Dairy, which is one of the oldest ice cream manufacturers in Australia, has obtained a license to manufacture Marvellous Creations ice cream from the Cadbury brand portfolio. One of those at the forefront of R&D for ice cream in Australia is Pecan Deluxe Candy, which has developed a positive reputation for innovation across the ice cream world and who develop ingredients suitable for high-volume producers. According to data from Innova Market Insights, milk chocolate is the leading and fastest growing ice cream flavor in Australia. Milk chocolate is the leading and fastest growing ice cream flavor in Australia. Current popular flavor combinations produced by Pecan Deluxe for the Australian market revolve around chocolate brownies, caramel sauce, cookie dough and praline nuts. 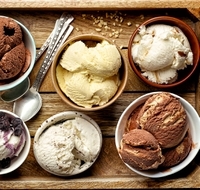 “Most new flavor combinations are still evolving around caramel, chocolate, brownies and cookies and cream, new variants may be appearing, but in terms of flavors the Australian ice cream market is still quite traditional, Graham Kingston, Managing Director EMEA & APAC, for Pecan Deluxe Candy, tells FoodIngredientsFirst. “We have also seen a rise in brands increasingly promoting single sourced, traceable ingredients to reinforce consumer trust. Therefore, a key part of the Pecan Deluxe Candy offering is the production of premium and indulgent ingredients using traditional artisan production methods, backed with full product traceability,” Kingston explains. In terms of innovation – in Australia ice cream sandwiches are definitely coming to the fore, including cookie variants, in particular, says Kingston. “Decadent flavors, guilt-free and sugar-free are global trends which have also taken root in Australia,” he adds. “Customers are always looking for indulgence and premium solutions, which is, of course, perfect for Pecan Deluxe Candy – added to more recent demands for clean label, traceability and transparency,” he explains. According to Innova Market Insights data, plant-based product claims have increased by 62 percent globally from 2013 to 2017. The vegan ice cream industry is booming and more and more retailers acknowledge its permanent right of place in our freezers. In August, Magnum, an internationally renowned brand from Unilever, announced the launch of its first-ever range of dairy-free ice creams, highlighting the monumental shift in consumer trends, with dairy-free products being more in demand than ever. You can read more on this here.